FERGUSON, Mo. (CNS) — Plywood covered the broken front windows of her restaurant, the back door served as the main entrance, and no diners appeared on this afternoon. Yet, Maria Flores counted her blessings. “God was watching over us,” Flores said, standing in the intact dining area at El Palenque restaurant about a block from the Ferguson Police Department. 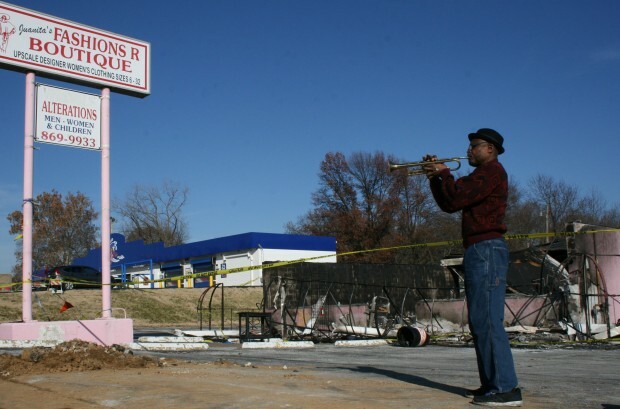 With the exception of broken windows, the restaurant and other businesses on the same street suffered no major damage in the rioting, looting and arson that impacted the area Nov. 24 in the aftermath of a grand jury’s decision to not indict Police Officer Darren Wilson in the shooting death of Michael Brown in August. The dining area at El Palenque looked like it normally does, with richly stained tables and benches, festive colors throughout, and, of course, a painting of Our Lady of Guadalupe overlooking the restaurant. Our Lady of Guadalupe also is painted on the plywood where the window used to be at the neighboring sandwich shop. Flores has asked for the board when the replacement window goes in. Our Lady of Guadalupe is a big part of Flores’ life. Not only are she and her husband, Joel, originally from Mexico, but they are parishioners at Our Lady of Guadalupe Church, three-quarters of a mile away from the restaurant. Msgr. Jack Schuler, the former pastor at Our Lady of Guadalupe, encouraged the couple to open the restaurant, which has been in business nine years. Their son Ricardo works there, and daughter Alejandra helps out on a part-time basis. Sister Cathy Doherty, a School Sister of Notre Dame and pastoral associate at Guadalupe, has been a regular at the restaurant and has pitched in to help in the Flores’ time of need. On the day after the rioting, Sister Cathy helped set up El Palenque to cater lunch at Cor Jesu High School. She also has spread word that catering is available for Christmas parties. El Palenque closed for just the day after the rioting but has closed early, around 6 p.m., since then. Though diners have been sparse, regular customers have started returning, and one of them might have helped save the business from arson. “A lady called the next day and told me, ‘I love to go to your place,’ and that she was kind of watching the neighborhood,” Flores said, adding that the caller told her the business might have been set afire if not for police presence. Other businesses weren’t as fortunate. Arsonists torched 21 buildings; they looted many more. Although Gov. Jay Nixon had called in the National Guard, members of the guard was absent on the night of the decision, and firefighters retreated after taking gunfire. Among the destroyed businesses, Juanita’s Fashions R Boutique subsequently benefited from the kindness of strangers. Four young men from West St. Louis County, including two brothers from St. Anselm Parish, set up a crowdfunding account at gofundme.com to raise money for business owner Juanita Morris. “It was really terrible that so many people were just having their livelihoods destroyed in just one night,” Eric Lee told the St. Louis Review, newspaper of the St. Louis Archdiocese. Devastated that 28 years of hard work had gone up in smoke in a matter of hours, Morris initially was skeptical when Lee called to offer help. Thinking this might be some kind of scam, she put him off again and again before several people asked her why she didn’t have a gofundme account. With these nudges, Morris figured Lee was legit, and Lee, Jeff Lu and Alex Conway went to Morris’ home in Ferguson Nov. 26. Three hours and a half later, www.gofundme.com/fashionsr was up and running. Just eight days later, on Dec. 3, 643 people from around the world had contributed $20,608, topping the account’s goal of $20,000. By Dec. 9, donors numbered 667 and the tally was $21,698. The young men’s willingness to help “just blew my mind,” Morris said. “I was overwhelmed by their love, kindness and the service they were begging me to take as much as I was with the fire. I don’t believe there are people who would give their time and service at no charge. That’s understandable, though. Conway, a freshman at St. Louis University, graduated from De Smet Jesuit High School, where the motto is, “Men for Others.” His brother, Max, who attends St. Louis Priory High School, also worked on Morris’ behalf. Like Alex Conway, Lee and Lu are college freshmen — Lee at North Carolina, and Lu at Penn State. Their work, as well as Sister Cathy’s effort on behalf of Flores, symbolizes the charity to which St. Louis Auxiliary Bishop Edward M. Rice referred in the archdiocese’s “Faith in Ferguson” prayer service Dec. 1 in January-Wabash Park.